LUIS ENRIQUE IS the right man for the Spain job, according to Michel Salgado. The former Barcelona coach was appointed as the nation’s new head coach on Monday, signing a two-year deal. 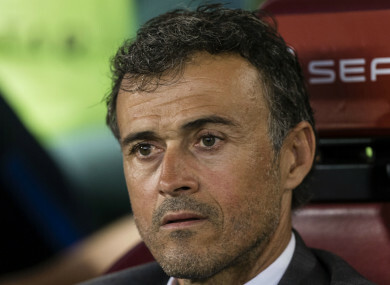 Luis Enrique replaces Fernando Hierro, who took on the role on the eve of the World Cup following Julen Lopetegui’s sacking ahead of his move to Real Madrid. The 2010 champions were dumped out of the tournament by hosts Russia in the round of 16, but former Spain international Salgado feels Luis Enrique has a better chance of succeeding than Hierro, who was parachuted into the role in difficult circumstances. “It is one of the fairest appointments there is, it is one of the best Spanish possibilities,” Salgado said at a FIFA event. “He has shown in Barcelona winning the treble, now he is free and in a very good situation. “You need someone to come, calm down, start a project from scratch… not from scratch, really, because you do not have to start from scratch. Email “Luis Enrique the right choice for Spain — Michel Salgado”. Feedback on “Luis Enrique the right choice for Spain — Michel Salgado”.